For a week here in Guadalajara, everywhere we go there’s green. Green bandanas and banners. Green signs. Green t-shirts and green skirts and an extraordinary amount of neon green lipstick. Last week, we went to a series of forums, trainings, panels and demonstrations to mark a week of festivities leading up to the Global Day of Action for Access to Safe and Legal Abortion. 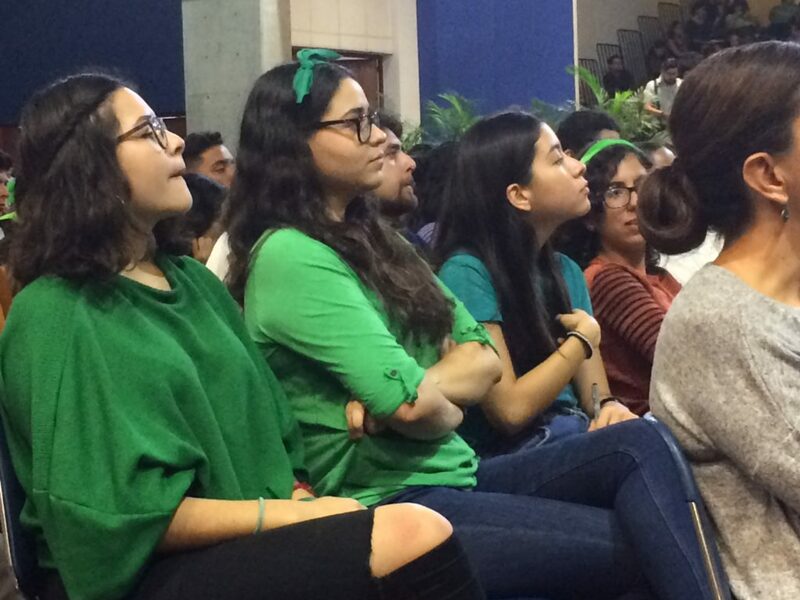 And everywhere we went, people were wearing green: the color that has come to symbolize the movement for reproductive rights that poured into the streets of Argentina this year, and has swept north across Latin America since then. Before the panel, we were trying to meet up with a professor who was attending the panel. “I’m here, sitting in the middle wearing a white shirt,” we texted her on WhatsApp. “I’m wearing green jajaja,” she replied.